1 A None No Power Seat 1 A is a standard Premium Class seat. This seat may have extra legroom due to the positioning of the bulkhead. The tray table is in the armrest, making the armrest immovable and slightly reducing seat width. The proximity to the lavatory may be bothersome. 1 B None No Power Seat 1 B is a standard Premium Class seat. This seat may have extra legroom due to the positioning of the bulkhead. The tray table is in the armrest, making the armrest immovable and slightly reducing seat width. The proximity to the lavatory may be bothersome. 10 A None No Power Seat 10 A is a standard Economy Class seat. However, this seat has an obstructed view due to the wing and propeller engine. 10 D None No Power Seat 10 D is a standard Economy Class seat. However, this seat has an obstructed view due to the wing and propeller engine. 11 A None No Power Seat 11 A is missing a window. If you like having a view, choose another seat. 11 D None No Power Seat 11 D is missing a window. If you like having a view, choose another seat. 12 A None No Power Seat 12 A is a standard Economy Class seat. However, this seat has an obstructed view due to the wing and propeller engine. 12 D None No Power Seat 12 D is a standard Economy Class seat. However, this seat has an obstructed view due to the wing and propeller engine. 13 A None No Power Seat 13 A is a standard Economy Class seat. However, this seat has an obstructed view due to the wing and propeller engine. 13 D None No Power Seat 13 D is a standard Economy Class seat. However, this seat has an obstructed view due to the wing and propeller engine. 14 A None No Power Seat 14 A is a standard Economy Class seat. However, this seat has an obstructed view due to the wing and propeller engine. 14 D None No Power Seat 14 D is a standard Economy Class seat. However, this seat has an obstructed view due to the wing and propeller engine. 15 A None No Power Seat 15 A is a standard Economy Class seat. However, this seat has an obstructed view due to the wing and propeller engine. 15 D None No Power Seat 15 D is a standard Economy Class seat. However, this seat has an obstructed view due to the wing and propeller engine. 19 A None No Power Seat 19 A is a standard Economy Class seat. The seats in the last two rows are generally more quiet since they are farthest from the propellers. 19 B None No Power Seat 19 B is a standard Economy Class seat. The seats in the last two rows are generally more quiet since they are farthest from the propellers. 19 C None No Power Seat 19 C is a standard Economy Class seat. The seats in the last two rows are generally more quiet since they are farthest from the propellers. 19 D None No Power Seat 19 D is a standard Economy Class seat. The seats in the last two rows are generally more quiet since they are farthest from the propellers. 2 A None No Power Seat 2 A is a standard Premium Class seat. 2 B None No Power Seat 2 B is a standard Premium Class seat. 2 C None No Power Seat 2 C is a standard Premium Class seat. This seat may have extra legroom due to the positioning of the bulkhead. The tray table is in the armrest, making the armrest immovable and slightly reducing seat width. 2 D None No Power Seat 2 D is a standard Premium Class seat. This seat may have extra legroom due to the positioning of the bulkhead. The tray table is in the armrest, making the armrest immovable and slightly reducing seat width. 20 A None No Power Seat 20 A is in the last row of the plane. The proximity to the galley may be bothersome. The seats in the last two rows are generally more quiet since they are farthest from the propellers. 20 B None No Power Seat 20 B is in the last row of the plane. The proximity to the galley may be bothersome. The seats in the last two rows are generally more quiet since they are farthest from the propellers. 20 C None No Power Seat 20 C is in the last row of the plane. The proximity to the galley may be bothersome. The seats in the last two rows are generally more quiet since they are farthest from the propellers. 20 D None No Power Seat 20 D is in the last row of the plane. The proximity to the galley may be bothersome. The seats in the last two rows are generally more quiet since they are farthest from the propellers. 3 A None No Power Seat 3 A is a standard Premium Class seat. 3 B None No Power Seat 3 B is a standard Premium Class seat. 3 C None No Power Seat 3 C is a standard Premium Class seat. 3 D None No Power Seat 3 D is a standard Premium Class seat. 7 A None No Power Seat 7 A is a standard Economy Class seat. However, this seat has an obstructed view due to the turboprop engine. The noise from the propellers may be bothersome. 7 B None No Power Seat 7 B is a standard Economy Class seat. However, the noise from the propellers may be bothersome. 7 C None No Power Seat 7 C is a standard Economy Class seat. However, the noise from the propellers may be bothersome. 7 D None No Power Seat 7 D is a standard Economy Class seat. However, this seat has an obstructed view due to the turboprop engine. The noise from the propellers may be bothersome. 8 A None No Power Seat 8 A is a standard Economy Class seat. However, this seat has an obstructed view due to the turboprop engine. The noise from the propellers may be bothersome. 8 B None No Power Seat 8 B is a standard Economy Class seat. However, the noise from the propellers may be bothersome. 8 C None No Power Seat 8 C is a standard Economy Class seat. However, the noise from the propellers may be bothersome. 8 D None No Power Seat 8 D is a standard Economy Class seat. However, this seat has an obstructed view due to the turboprop engine. The noise from the propellers may be bothersome. 9 A None No Power Seat 9 A is a standard Economy Class seat. However, this seat has an obstructed view due to the turboprop engine. The noise from the propellers may be bothersome. 9 B None No Power Seat 9 B is a standard Economy Class seat. However, the noise from the propellers may be bothersome. 9 C None No Power Seat 9 C is a standard Economy Class seat. However, the noise from the propellers may be bothersome. 9 D None No Power Seat 9 D is a standard Economy Class seat. However, this seat has an obstructed view due to the turboprop engine. The noise from the propellers may be bothersome. The Q400 is a twin-engined turboprop aircraft manufactured by the Canadian company Bombardier. The "Q" in the name stands for "quiet", because the noise and vibration suppression system (NVS) neutralises a large proportion interior and exterior noise, making the aircraft one of the quietest in its class. This aircraft type is also environmentally friendly because of its fuel economy and much lower CO2 emissions than comparable jets. WestJet added the Q400 to its fleet in June 2013. The Premium section is located in the first three rows of the aircraft. Passengers seated in Premium seats will get advance boarding, first access to overhead bins, and complimentary food and beverages (selections vary). In addition, the Premium fare offers passengers the ability to change or cancel flights for no fee. The WestJet Q400 is a single class aircraft that operates on short-haul flights. This version is configured in a 2-2 format and is flying with 78 seats of Economy Class. The coffee service on this plane is just a packet of instant powder with a cup of hot water. Get yourself a cup before you board. Luckily Westjet upgraded us to Premium and we didn't pay... because there is no way that it is worth it to pay for Premium. There is no noticeable extra space, seats are exactly the same other than a 'Plus' logo on the headrest, and since it was only a 49 minute flight, we were given a bottle of water... before taxiing... because the plane was waiting on another passenger. Cramped plane, cramped seats. I'd rather fly on the old Dash8 than this new Q400. This seat was listed as "Economy Plus". I have never had a more uncomfortable flight, and I fly regularly to offshore rigs in a helicopter. There was no extra leg room. If anything it was more cramped. The seat was extremely narrow, and I had to squeeze myself in between the armrests and use a seatbelt extension. This added to the fact that I am tall (6'3") and had to lean toward the poor passenger in the seat next to me in order to follow the contour of the cabin. The leg room was also reduced due to the same curvature of the cabin. This flight was ridiculously cramped, and I am not small by any means, but I fly regularly in all types of aircraft, including Air Canada's Q400s, without any of these issues. My first and last trip on a West Jet Q400. This seat is good, comfortable and reasonably quiet. I transferred off a Westjet 737-700 aircraft, and this seat was more comfortable that the 737. For the recline, the seat slides forward a bit as the back reclines, so it feels more comfortable, and it does not encroach as much on the person behind you. The seats are thin, which means that at 30" pitch, they seem better that the same pitch in the 737 with thicker seats. It is narrow at 17", but that seems to be the normal now. My flight was all of 35 minutes, so the seat was comfortable for that length of flight. I also took the Westjet Link Saab 340b on the way home, and I don't think you realize how quiet this Q400 plane is until you try an aircraft that sounds like industry machinery. Sit near the back, away from the prop engines, and you'll enjoy the quiet. This is the best prop plane I have flown. I do agree with one of the other comments, in that the Air Canada version of this plane has good seats too, with an inch more pitch. The Q400 is a great evolution of the Dash 8 designs, safe and efficient. However, Westjet has configured these planes so tightly, that unless you are 5'4" sitting in the window seat will be a claustrophobic event. For some reason, the seats also recline, so if that happens you have about 4" for your head. Forget opening the seat back tray. Avoid if you can. This seat did not have extra legroom due to the proximity of the bulkhead. If anything I had less legroom than other seats. Faster and quieter than older Dash 8's, but WestJet uses awful seats in their Q400's. Air Canada's are much better. I had the window seat near the end of the plane. The seats in the rear are quieter than the seats at the front, and don't have the issues of a lavatory right there (I can't see how WJ can sell "plus" seats at the front when its noisier). We were served drinks very early in the flight due to the carts being in the rear (another unpaid plus). I found it much quieter and than other Dash 8 style aircraft I've been on before (AC Q300 comes to mind, a shaky, noisy mess). Only issue was the curve at the window seat that limited foot space, as well as the vibrations while taxiing. My legs were begin to ache after only a 55 minute flight. The seats in this bird are terribly narrow. Taxiing is bumpy at best. The interior trim is quite nice, however, if you're not skinny, these seats fit like a bad pair of leather pants! On the bright side, service was great as always! This was my first and last time flying in a prop plane! I was flying from Kelowna to YVR and was originally in seat 6a. I moved voluntarily as they needed more weight distribution and I'm glad I did in a way as I was next to the props. Just behind the wing and right by the landing gear was my new seat and, it wasn't too loud and the seats were fine for a short flight. The plane itself was so bouncy when taxing and we had quite a bit of turbulence and you felt every jolt, drop, and jostle. We were safe, no doubt but I had to keep my eyes closed most of the time just to avoid motion sickness and silent prayers ha ha! Good legroom but no window as window is in exit door ahead of seat. Also, view from windows is better in even numbered rows. Not a quiet plane. I spent the money on for the westjet premium seating, there is no additional space between the seats and the center armrest is only an inch and a quarter wide. The foot room for the window seat is also impeded by the rail that attaches the seats, reduced leg and storage room. Excellent seat. great view. overhead bins are quite small as is the space underneath. it is worth reserving seat for $5. Booked 4C off previous comments. Plenty of leg room as indicated. However, found other comments unfounded re this aircraft being cramped, claustrophobic or noisy. Quite the opposite..very enjoyable flight & I'm 6 ft tall. First time on the Q400. Disappointed in leg room on rows 6 to back of aircraft. 30" pitch claim rivals Air Canada rouge's 29" in steerage. Rows 4 & 5 offer the same legroom as Rows 1 to 3, which are premium priced. 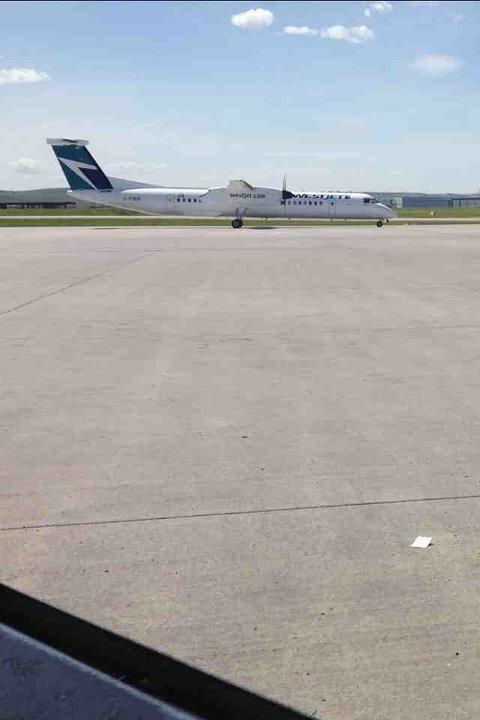 The Westjet daily Q400 linking Sydney and Halifax is welcome. But I think even the cabin attendants were embarrassed to offer guests the standard fare on this route: Water (without ice) and a cracker Polly says I want more, even on a short flight. Very poor seat design, a shame for a new aircraft. I cannot sit comfortably in any window seat in this aircraft because of the curvature of the wall where it meets the floor does not leave much flat floor area to put your feet. I fly frequently on other small planes and they are more comfortable. The Saab 340 and Beech 1900D come to mind. On my last flight I changed to an aisle seat - it was much better. This is a terrible aircraft. Upon entering the aircraft I banged my head on the top of the door. I am only 5ft 8 inches. When the aircraft was taxiing at VVR you could feel every bump. I do not think that this plane has shocks. The seats have the feel of sitting on a piece of 3/4 inch plywood with no cushion. It is so noisy that you cannot carry on a conversation with the person beside you. Westjet needs to issue passengers earplugs to prevent hearing loss. it is so noisy that you cannot hear the announcements on the PA. I thought that the plane was going to shake itself apart. Never again. I will avoid this aircraft at all costs. 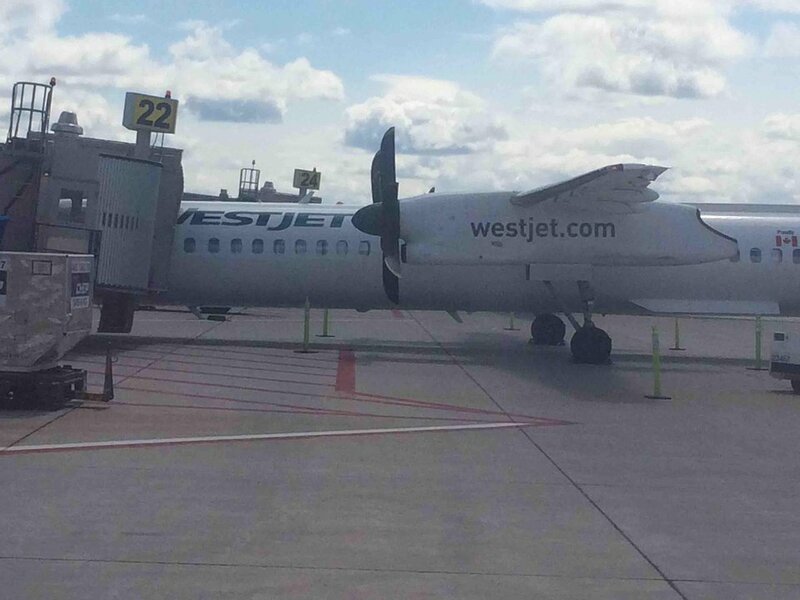 WestJet flies 1 versions of Bombardier Q400.